You’ve just completed the 5 Minute Installation of WordPress or one-click install from your web host. Now what? of your website. Visit your site’s login page by placing “wp-admin” after your domain name (e.g. as well. 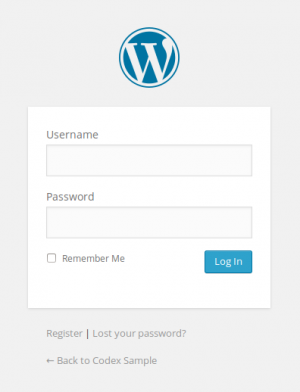 Now log into WordPress using your username and password.
. This is the brain behind your website, the place where you can let your creativity explode, writing brilliant prose and designing the best and most lovely website possible. This is where the organization of your site begins – and this is just the start. At the top of the screen is the area called the “toolbar.” Click on the link that is your site name. This will take you to a view of your new WordPress site. Like it? Don’t like it? Doesn’t matter, just look at it. This is where you are going to be spending a lot of time! Take time to look at the site before you get into the changing of things and figuring out how all of this works; it’s important to see how the WordPress Twenty Seventeen theme is laid out and how it works. Consider this the test drive before you start adding on all the special features. The layout you are looking at is called a WordPress Theme. It is the appearance of your website, styling the look of the site and the framing of the content. The WordPress Twenty Seventeen theme features a “header” at the top with the title and tagline for your site. Below this is your Menu. Along the side you will see some titles and links. This comprises Widgets. Within the main middle section of the page is the content area. At the bottom of the page is the footer. Let’s look at the post for a moment. There is a “title,” and below the title is the date the post was written, then the body of the post, and finally some information about the post. This is called the post meta data and contains information about the post such as the category assigned to that post. Back to the sidebar, you will see different sections with information. Among these you may find a list of Recent Posts, Recent Comments, Archives, Categories, and links to the Administration Screens, Log Out, and RSS feeds. This is part of the menu or navigation Screen that people will use to move around your site, visiting posts from different categories or time periods. Take time to notice the smaller details of this web page layout and design. Move your mouse over the title of the article post. Notice how it changes color. This is called a hover. Most Themes feature a distinctive color or underline when you move your mouse over a link. Move your mouse over any of the links in the sidebar. Do they change? Is the change the same? You can change your link hovers to look different in different sections of your page. Also look at the color of the links. How are they colored or underlined to stand out from the rest of the text? For now you only have one post. It is residing within a page that is laid out as your home page or the front page. If you click on the title of the post, it will take you to the specific page for that post. The first page or home page of your site features the most recent posts on your site. Each post title will link to the actual page of the post. Some Theme designers design their single post pages to look different from the home page. By clicking on the title, you are taken to another web page that looks different from the home page. Now that you have an idea of how your site looks and what the different layout sections are called, it’s time to test drive the WordPress Administration. This is like familiarizing yourself with the backend of your new website. In fact, the first page you see after logging in is called the Dashboard, a collection of information and data about the activities and actions on your WordPress site. 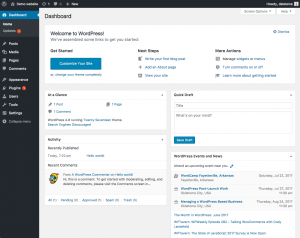 The Dashboard helps to keep you up to date on new and interesting bits of information from the many WordPress resources. In the corner, it also features a list of the most recent activity you’ve accomplished on your site. On the left side of the screen is the main navigation menu detailing each of the administrative functions you can perform. Move your mouse down the list and the sub-menus will “fly out” for you to move your mouse to and click. Once you choose a “parent” navigation section, it will open up to reveal the options within that section. The links in the above list will take you to a series of articles that will guide you step-by-step through every aspect of the Admin Screens. You are anxious to get started, so for now, let’s start with the Users Screen. 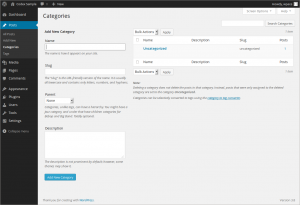 Now, let’s look at some other powerful features of the WordPress Admin. 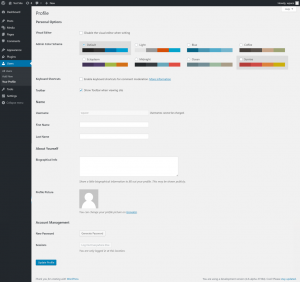 The Appearance, Themes Screen allows you to change the look of your site using different Themes. Themes are presentation styles that completely change the look of your site. Designed by WordPress developers and users, there are hundreds of themes available for you to choose from. In your Appearance Screen, you will see a list of currently installed themes, including the WordPress Twenty Seventeen theme. To quickly change the theme, simply click on the Activate button under one of the themes listed, then click on your site name in the top toolbar to see how it looks. Wow, you have another look and nothing else on the site has changed. It’s that easy. to bring the design back to what you had. To see it again, click your site name in the toolbar, and there it is. If the screen looks a little intimidating, the Codex article on Writing a Post will take you step-by-step through the process of writing a post. Take a moment to read through the article and post your first entry and then return to this article and we’ll take you onto the next step. If you are in a hurry, then simply fill in the blanks, one by one, in the post beginning with the title and then write a little test message in the post window. This is just for a test, so you can write anything you want. When you are done, click the Publish button that is to the right of the post entry window and it is done. You will then see a blank Write a Post screen and you’re ready to write another post. Go ahead. But do only three to four entries. There’s more exciting work ahead! Now that you’ve gotten a feel for writing posts, you can view your posts by clicking your site name in the toolbar on top of the screen. Now it’s time to get down to the real work. If you want to create a good and solid website, you need a good and solid plan. I know it’s hard to do, and I know you want to keep playing with your new website, but it’s time to take a break away from your computer and turn to pen and paper. On a piece of paper, describe your site. Take five to twenty minutes to come up with a purpose for your site, or better yet, call it your Mission Statement. How often am I going to be posting and adding information? posts every _____________ about ________ _______ ______________. I am doing this because _____________ _____________ __________________. From this exercise, we’ve gathered a lot of information. We’ve uncovered information on how you might layout and design your site. If you know your audience is mostly made up of young people under the age of 25, you will probably want a fashionable look ranging from wild colors and crazy graphics to dark foreboding tones. If you are providing factual information about a serious subject, then you will probably want a more conservative look where the information is more important than a lot of pop and flash. You may already have a design idea in mind, or perhaps you will be copying over from your previous site, but take a moment to use this information to reconsider your design, and to see how what you want will work with the WordPress options. Your topics are your categories. Write your categories down below your purpose paragraph and notes about your web page design. Now, what subcategories might be under these topics? Under Computer Tips, you might want to segregate them by Windows, Linux, and Mac. Or maybe Software and Hardware. You can have sub-sub-categories, but let’s stop with subcategories for right now. Write these down. Remember the question about why you are doing this? Is it because you have valuable and timely information or knowledge to share, because you want to talk about a subject that interests you, or maybe because you just think it will be fun to do. Understanding the timeliness of the information you want to present on your site helps you organize the information on your website. Your website is organized by several different methods. If the date of when you posted the information is critical to the success of the page, then having links to your posts referenced by date is important. If the information itself is more important and timeless, then having your posts referenced by category is the best choice. Have you noticed that you are starting to lay out your website? If you remember our earlier test drive of your new WordPress website, we examined the sidebar menu. This is the area where your past posts are organized. If you take another look, you will see the sidebar is laid out in a list, including Archives by date and Categories by category. It may even feature a calendar. As you lay out your website on paper, consider whether you want both categories and dates, or just one of them in your sidebar. What information you have and how you want to help the user find the information is critical to your website design. As you think about what information the user will need to know, you have to consider what information you are willing to share with them. That information may include how to contact you, what the purpose of the site is, who you are, and what your expertise is. Responding to comments and moderating them can also take up a lot of time. If they are critical to your site, then include them and consider how you want them presented. Go back to your test site; the first post created at the time of installation included a sample comment. You can even make a few comments yourself on the posts you created. Take a look at how they are laid out and consider how you might want them to look to fit into the design and layout of your site. With this basic information, you are ready to return to your computer and start setting up your site. You may want to install plugins such as Jetpack by WordPress.com to supercharge your website, and don’t forget to activate the Akismet WordPress Plugin that is available with all WordPress sites to help protect it from comment spam. But now, let’s start with making those categories you wrote down before. In the Posts > Categories tab, in the Add New Category area, fill in the information about your category. Continue to add your parent categories, going down the list. Hold off on entering subcategories until all the main categories are entered. NOTE: You can add any new categories at any time, but make a note of the fact that categories can be sorted in WordPress in two ways: by name (alphabetically) or by ID number. As you enter the categories, they are assigned an ID number. It is difficult to change this, so if you don’t want your categories sorted alphabetically, enter them in the order you want to see them presented on the screen. button. Repeat this for your other test posts, putting each one in a different category. There is more to think about when it comes to having comments on your site. Unfortunately we live in a world where spam is a fact of life. It is recommended that you begin battling the comment spammers with the helpful article, Introduction to Dealing with Comment Spam. You’ve now done all the basics for your new WordPress website. You know how to write a post, create a category, and how to view your site’s information by category and archive. You can start the customization process, and when you are done, don’t forget to delete your test posts! Then start writing some wonderful information to share with your new-found public! Once you are familiar with how WordPress works, it’s time to get creative and start customizing. The tutorial now splits into different subjects that require no order. From here on you can do whatever you want, adding and subtracting, perfecting and scrambling your site at will. The amount of effort you put into the site is now up to you. You can work with the two WordPress Themes that came with the installation, or seek out another Theme that better meets your needs. Or you can create your own Child Theme. You can totally customize all the links and information, or get serious and completely re-design the entire site to do whatever you want. You have the basics, the rest is up to your imagination. Look for one that better suits the look you desire on your site. When you are ready to plunge into the code, you can customize the look and layout of your site through CSS and modifying the Themes (or create your own). If your customizing goals are not seriously extensive, a good bet would be to develop your own Child Theme. A minimal Child Theme is a fairly simple project if you have a little coding experience. Plugins add function and sometimes fun to your site. There are hundreds of different plugins for adding custom links like related articles to your sidebar to adding weather reports. Just like Child Themes are an easy way to customize the look of your site, with a bit of coding experience, your own minimal Plugin is an easy way to change how your site works. There are hundreds of WordPress Themes to choose from. All do basically the same thing but graphically present the information in a myriad of ways. Choose a few that look interesting to you, and meet your audience’s needs and your desires, and then test drive them following the test drive instructions above. Click through the whole site, the categories and archives as well as the individual posts to see how the Theme handles each one. The look may be nice on the front page, but if it handles things in a way you don’t like in the single post, then you will have to dig into the code and make changes. Not ready for that, try another theme. If you run into problems, check out the Codex’s Troubleshooting Themes article. 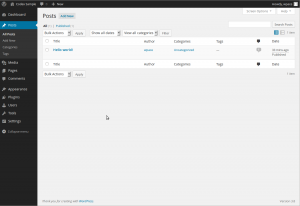 through the WordPress Admin Plugin Screen, just follow the instructions provided by the plugin author. Remember, these are free and non-essential. If you have any problems with plugins, contact the plugin author’s website or plugin source first, then search the Internet for help with that specific plugin, and if you haven’t found a solution, then visit the WordPress forums for more help. The exciting thing about WordPress is that there are few limits. Thousands of people are using WordPress for blogging and for running their websites. 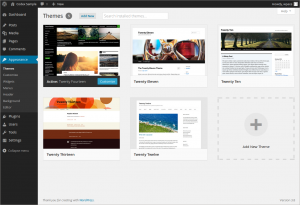 For example, look at some of the entries under the WordPress.org Theme Showcase. All have a different look and different functions on their sites. Press It – Post to your site from the web instantly!